GuardianCoil® Safety Barriers protect personnel, contain debris and comply with Occupational Safety and Health Administration (OSHA) requirements to prevent injuries from projectiles. Industrial servicing and manufacturing facilities are high-risk workplaces, especially if machines are not sufficiently guarded. Flying debris and moving machine parts can cause serious injuries, amputations, and lacerations. Regular maintenance checks are helpful to prevent malfunctions, but accidents can and do occur when working with high-powered machinery. It is imperative for facility managers to implement a second line of defense to protect their valued employees. Facility managers at Canada West Harvest Centre are aware of the necessity to install safety guards around machines in order to avoid injuries from pinch points or projectiles. Seeking a visually unobtrusive system with a long lifecycle, they chose Cascade Industrial Safety and Security Systems with GuardianCoil® coiled wire fabric. Canada West Harvest Centre is a CLAAS agricultural dealership with locations in Emerald Park, Swift Current, Saskatoon, and Yorkton – selling and servicing the full line of CLAAS equipment for Southern Saskatchewan. CLAAS itself is an agricultural machinery manufacturer founded in 1913 with headquarters in Harsewinkel, Germany. CLAAS utilizes its network of dealers like Canada West Harvest Centre to expand its international presence and support continued growth. The CLAAS product range includes combine and forage harvesters, balers, mowers, tractors, tedders, and other harvesting machines. Heavily relied upon in the field, this equipment often needs maintenance, requiring the use of high-powered machinery. At three separate Canada West Harvest Centre locations – Swift Current, Emerald Park, and Yorkton – Gray SP-25 heavy-duty shop presses with a 25-ton capacity are utilized to service components of CLAAS agricultural equipment. To protect its machine operators and surrounding personnel, Canada West Harvest Centre relies on a proven manufacturer of industrial safety and security systems: Cascade Coil. Cascade’s GuardianCoil® coiled wire fabric is the base material for its industrial safety and security systems. It is an excellent barrier between operator and machine, protecting workers and containing debris while complying with OSHA requirements to prevent injuries from projectiles. The fabric is typically black, safety yellow, or stainless steel, so the operator’s eyes can easily focus on the point of operation. The curtains are lightweight, easy to install, maintenance free, and allow natural light and visibility into the space. The SP-25 shop press is capable of applying 50,000 pounds of pressure to push on or off bearings, gears, bushings or any other part that requires consistent force to remove or replace. Warren Gaetz, Parts Department at Canada West Harvest Centre, Emerald Park location, knows that flying projectiles from equipment under this much force can be lethal to technicians. GuardianCoil® fabric connects to industrial safety hooks that slide effortlessly along the press guard pipe assembly. The three Canada West Harvest Centre guard kits feature fabric in 31” x 69”, 39” x 69”, and 39” x 75” sizes – but GuardianCoil® can be designed and manufactured to custom sizes for unique applications. Easily operable safety hooks allow for machine operators to access equipment during downtime and for maintenance when required. The guards can be opened quickly to load and inspect a part then closed and secured during press operation. The 1/4″ weave 19-gauge steel coiled wire fabric allows visibility of the machine process without sacrificing the operator’s safety. Cascade Coil systems are a cost-effective alternative to traditional safety guards, but still achieve the full range of protective functions necessary for an industrial setting. 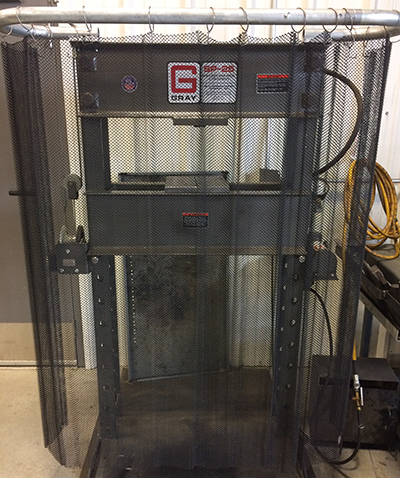 As featured on the Canada West Harvest Centre’s press guards, GuardianCoil® is typically secured at the top and hangs free at both sides and the bottom. This allows the durable coiled wire fabric to wrap around a projectile upon contact and drop it to the floor. GuardianCoil’s flexibility prevents the object from leaving the work area or ricocheting back toward the operator or their surroundings. Canada West Harvest Centre primarily uses the SP-25 shop presses for pressing bearings back into housings. Should a component ever chip, break, or come loose under pressure, the employees’ safety is preserved with GuardianCoil®. Ready to talk to Cascade? We at Cascade Coil look forward to partnering with you on the design, engineering, and specification assistance of your coiled wire fabric system. To find the ideal system for your project, explore our divisions above. Or, you can simply request a budgetary quote based on your own specification, request a sample, or just introduce yourself. Either way, take a minute and send us an email or give us a call.